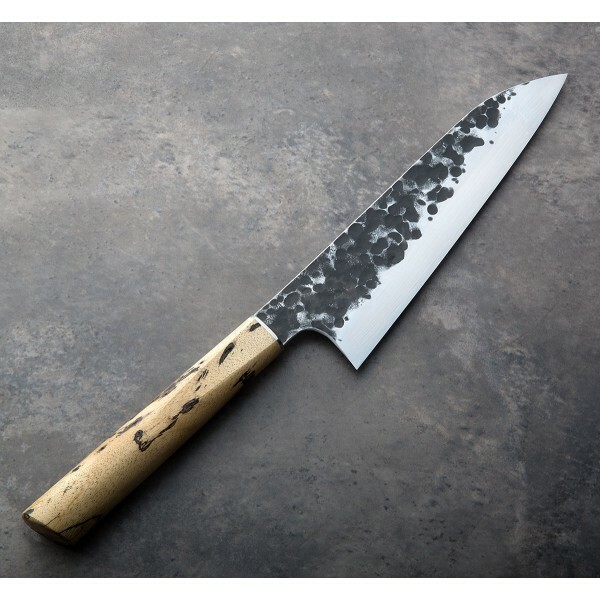 Our first piece by Australian bladesmith James Oatley of Oatley Knives, this 200mm / 7.87" chef knife is hand-forged from 12c27 carbon steel with a wide bevel grind and forge-finished flats. James cryogenically treats the blade and tempers to a hardness of 61HRC to create a thin, sharp and hard edge in a light, fast package. 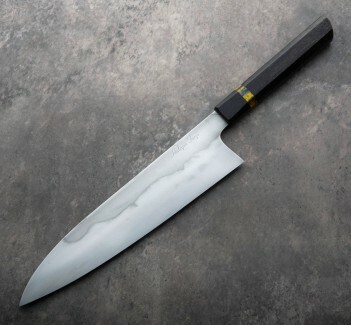 Measuring 55mm tall at the heel and weighing just 6.6oz / 188g this is a laser of a knife, light and fast in the hand and designed to conquer virtually any cutting task in every kitchen. 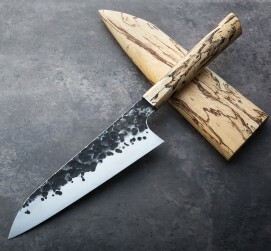 The gorgeous tamarind wood handle is tapered gently toward the front and fitted with a 12c27 bolster. 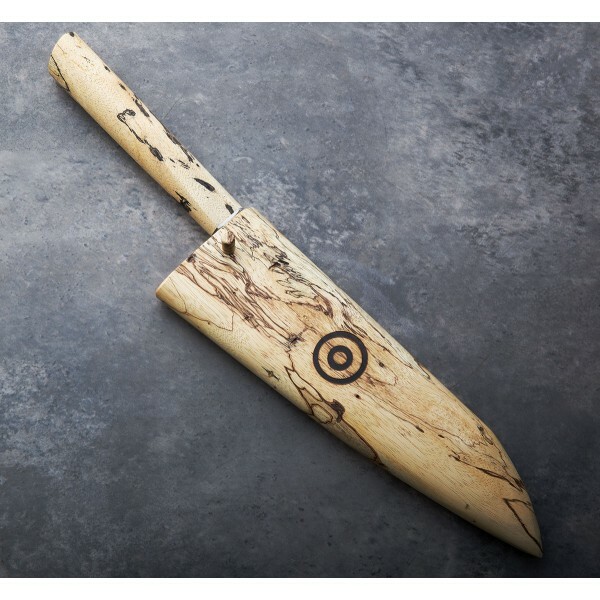 A matching tamarind wood saya handmade by James with tamarind wood and steel pin is included. James Oatley is a St. Leonards, Australia based knife maker who grew up with a grandfather that worked as a butcher, and a life-long love of knives. 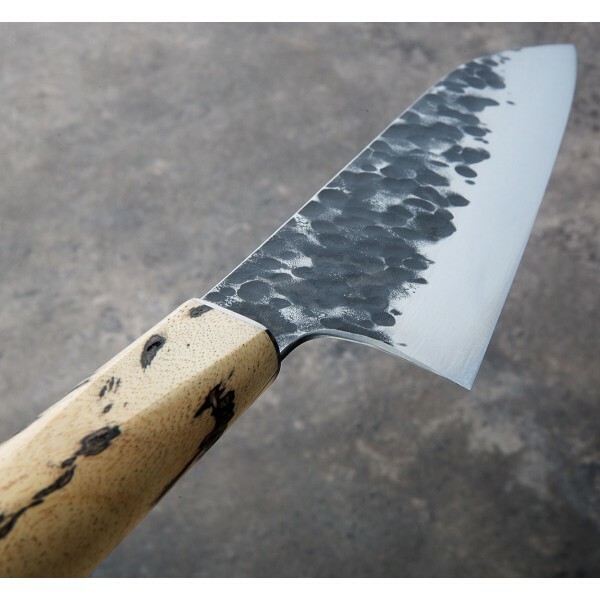 An instinctive desire to create edged tools made for daily use has led James to focus on high-quality, handmade culinary tools that range from single-bevel sujihiki's to hard-use deba's and unique and stunning chef knives like the Tamarind Forged Chef 200mm featured here. 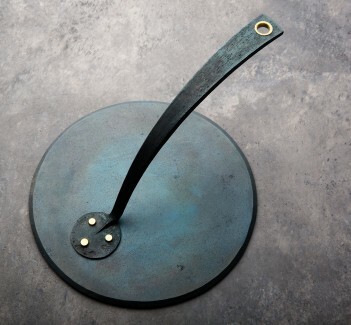 Outstanding attention to detail and a recognizable aesthetic all his own, James has garnered a respectable and well deserved following amongst chefs and we are honored to represent his work here on Eatingtools. Blade length: 200mm / 7.87".  Overall length: 365mm / 14.4" overall. Blade width at the choil: 2.0mm. Blade width one inch from tip: 1.7mm. Blade height at heel: 55mm. Weight: 6.6oz / 188g. Blade: Forged 12c27 carbon steel. Handle: Tamarind wood. Saya: Tamarind wood with 12c27 pin.